Welcome to Mrs. Sáles’s voice studio! Madeline Holly-Sales participated in vocal ensembles and musical theater throughout childhood. Her move to Brazil in 2001 initiated an in depth study into classical and contemporary vocal technique. She has performed in Brazil, Turkey, Austria, Germany and the United States. 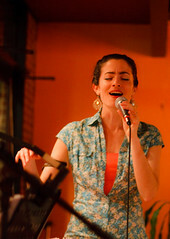 Madeline is currently the lead vocalist for Beleza Brasil, combining the sounds of samba, funk, soul, jazz and bossa nova. She released her first CD in 2006 entitled Time to Dream. For audio samples visit: belezabrasil.net or myspace.com/belezabrasil. I believe that singing plays an integral part in self expression. As a voice educator, it is my responsibility to provide well prepared, quality instruction to help each student realize her own individual potential and abilities. Through my education and love of music, I intend to inspire students and help them realize their great potential. I will be offering voice lessons at Burley this year to help students work on their individual goals as vocalists. The times available at Burley are Monday afternoons (4:05pm – 6:35pm) and Tuesday mornings (8:00am-9:00am). Otherwise, students may come to my home studio on other days of the week. Students may sign up for one lesson to begin study. Thereafter, lessons shall be reserved and paid for on a monthly basis (package of 4 or 5). Please pay at the beginning of each month. Please make checks payable to Burley Middle School Chorus. Students must give at least 24 hours' notice in order to cancel or reschedule a lesson. No refunds or make-ups are offered for lessons that are short-notice. One cancellation or reschedule each 2 month period is acceptable.